A mobile site has to be very easy to use because it has a small screen which has to navigated with an oversized thumb or finger. This site was created using Blogger so it will display a different version of the page you are looking at depending on what type of device you are using. If you are using a mobile phone to view this site then you should see a selection of recent blogs which includes a thumb sized link to each mobile web page. If you are using a desktop or laptop device you should see the full page with side bars and footers. However if you are writing your own site from scratch, these tools will probably not be available to you. This makes for an interesting design problem that has to be thought about before you can start writing for the site. Here are the 10 main things to think about before you starting to create your site. Its worth thinking about different combinations as each web site will have a different emphasis on what it is trying to achieve. 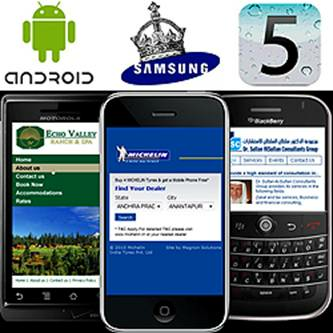 Test your pages Be sure to test your pages in both smart phones like the iPhone and less sophisticated mobile devices like PDAs.